As an INDEPENDENT PUBLICIST, currently specializing in METAL, HARD ROCK, BLUES and JAZZ for European & USA Markets, Barbara Lysiak International works effectively on behalf of artists, labels and media companies that want personal attention, meaningful results and respect for their budgets. Barbara has done many successful press campaigns for new album releases; She has generated feature stories and in depth interviews in major publications for her clients throughout the world; And she has covered complete tours in all European territories. It is very unusual for a European publicist to be able to work in multiple territories but this is part of the formula that makes Barbara Lysiak International so effective. Speaking both French and English, Barbara is able to communicate a positive energy to print and electronic journalists that expresses her enthusiasm for the select projects that she feels strongly about representing. In addition to traditional methods of publicizing her clients, Barbara also incorporates a robust mix of social media into her projects. This brings an exciting new dimension to the profile she builds for each project. The bottom line is that artists, business and media people appreciate dealing with her because of her professional attitude and also because she will only represent projects that she feels have real substance and merit serious attention. Having recently worked with artists such as Susan Tedeschi, Steve Stevens, Glen Drover, Dave Martone, Jordan Rudess, Alex Skolnick, Lee Rocker and entertainment companies such as Magna Carta Records, Alligator Records, Moogis and Macklam / Feldman Management, Points North, Moetar, Pinnick Gales Pridgen, Barbara Lysiak International has a proven track record of successful press campaigns. 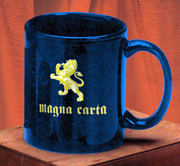 New Magna Carta Mug Available Now! 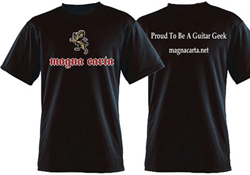 New Magna Carta T-shirts Available Now! Show That You're "'Proud To Be A Guitar Geek"
Amid sonic references to Zappa, The Beatles, XTC, Gentle Giant, Laurie Anderson and many others, MoeTar offers a fresh approach to rock, pop, electronica and experimental music. Points North stands on the shoulders of rock artists as Rush, Dixie Dregs and Eric Johnson but, as the title of their debut instrumental guitar album suggests, clearly cuts its own artistic path. OHMphrey's latest effort, the unforgettable, and soon-to-be-classic, "Posthaste", finds these five extraordinary artists creating instrumental music with a unified voice – once again. The album's seven original instrumental compositions, and two bonus live tracks ("Firestarter" and "20/20") recorded at Winston's in San Diego in 2009, contain some of the most thought-provoking, elastic and heavy jam band music this side of "A Live One", "Space Wrangler", and "Under the Table and Dreaming". The Android Meme bring together and blend the influences of bands as diverse as Skinny Puppy, NIN, Tool, Genesis, Peter Gabriel, Rush, Econoline Crush, Fear Factory and King Crimson. Listen to samples from their Magna Carta debut, "Ordo Ab Chao". The Epiphany, the debut CD from the symphonic metal band X Opus, is a celestial blend of enigmatic lyrical threads and layered neoclassical metal. Tracks such as “Terrified”, “Forsaken” “On Top of the World”, “Pharaohs of Lies” and “In the Heavens” are haunting yet radiant musical vignettes, imbued with the power of spiritual transformation. With the release of his solo debut, Metalusion, guitarist Glen Drover, best known for his precision and power playing withheadbanger icons Megadeth and Eidolon, blends the venom and attack of modern metal and the technically demanding musicianship that defines the classic jazz-rock genre. The December People’s Rattle & Humbug will breathe new life into Christmas classics for this holiday season on October 12th. The December People perform all newly recorded songs in the style of classic rock legends like U2, Santana, The Who and Boston. K2 is a true progressive rock band that combines influences of Genesis, Yes, ELP and UK. With vocals reminiscent of PeterGabriel, bass recalling Yes’ Chris Squire and keyboards from Ryo of Spock’s Beard that bring to mind Rick Wakeman and Tony Banks, K2 is a prog lover’s dream. Eyal Levi and Emil Werstler will unleash their new collaboration,Levi/Werstler Avalanche of Worms on Magna Carta Records April 20th 2010. Avalanche of Worms also features famed Cynic drummer Sean Reinert. Levi and Werstler are best known for their work as the guitarists in the Atlanta-based metal band Daath. Tempest's "Another Dawn" will see daybreak on Magna Carta Records March 30th. The band is made up of members from 5 different countries, with more than 20 years on the road, and the desire to bring their musical tradition to as many people as possible. Tempest is a band with something meaningful to say and the ability to say it while still being very entertaining. Derdian’s style combines thrash metal guitar riffs with epic symphonic compositions. There is a lot of atmosphere and keyboards along with metal crunch and emotional power metal vocals. For fans of Coheed & Cambria, Opeth, DragonForce, Rhapsody of Fire and Kamelot.